These candlesticks are a set of 6, sent as a gift to St. Michael’s Parish in 1769 by Mr. Laurence Carew, a Waterford Émigré in Cadiz in Spain. The Carew family, who established themselves in Cadiz, set up the Carew-Langton Charity in St. Patrick’s Parish to provide housing & support for the poor. They also endowed St. Michael’s Parish Church with a silver crucifix reliquay in 1752. 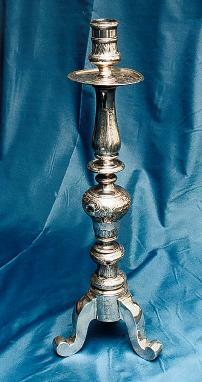 The candlesticks are each 5kg in weight and 67cm each in Height. They are white metal with silver content.